GLOSS: Spine Graphic + Title EMBOSS: TITLE GLOSS: Watermark, TITLE, A NOVEL copy GLOSS: Back Cover Graphic OVERALL MATTE Set against the dazzling backdrop of Golden Age Hollywood, novelist Anne Girard tells the enchanting story of Jean Harlow, one of the most iconic stars in the history of film It's the Roaring Twenties and seventeen-year-old Harlean Carpenter McGrew has run off to Beverly Hills. She's chasing a dream-to escape her small, Midwestern life and see her name in lights. In California, Harlean has everything a girl could want-a rich husband, glamorous parties, socialite friends-except an outlet for her talent. But everything changes when a dare pushes her to embrace her true ambition-to be an actress on the silver screen. With her timeless beauty and striking shade of platinum-blond hair, Harlean becomes Jean Harlow. And as she's thrust into the limelight, Jean learns that this new world of opportunity comes with its own set of burdens. Torn between her family and her passion to perform, Jean is forced to confront the difficult truth-that fame comes at a price, if only she's willing to pay it. 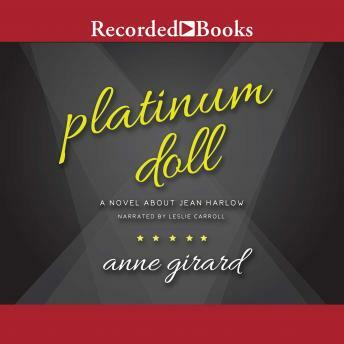 Amid a glittering cast of ingenues and Hollywood titans-Clara Bow, Clark Gable, Laurel and Hardy, Howard Hughes-Platinum Doll introduces us to the star who would shine brighter than them all.